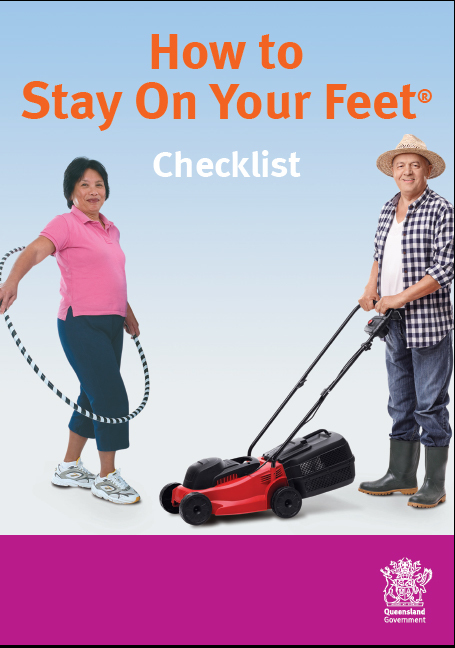 This section includes Queensland Stay On Your Feet® resources and other healthy active ageing resources to help seniors age with vitality and stay independent. 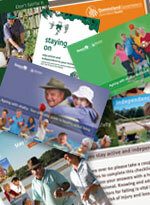 For those who require less than ten brochures please email us at stayonyourfeet@health.qld.gov.au. If you are ready and able to become more healthy and active, and would like to find out the services available in your community to help you, find some providers in your local area. 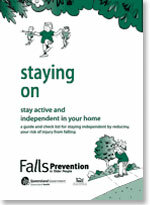 This brochure will advise you how to Stay On Your Feet® in hospital, reduce the risk of a fall and prepare for going home. These two brochures have identical content except for the front images. To order the BE SAFE Brochures go to OfficeMax. This short checklist helps older people quickly identify issues that may put them at risk of a fall. After completing the checklist, seniors can discuss any concerns with a health professional. 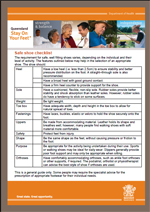 To order the Stay On Your Feet Short Checklist go to OfficeMax. This comprehensive checklist covers a range of factors that may put older people at risk of a fall including wellbeing, nutrition, physical activity, health conditions, footwear and hazards in and around the home. Potential solutions for overcoming any issues identified are provided. It is recommended that older people complete this checklist with a health professional. To order the Stay On Your Feet Long Checklist go to OfficeMax. The foot health checklist will help you stay on your feet. 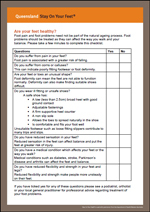 The foot health checklist helps to identify any foot problems that may affect your walking and balance. The safe shoe checklist outlines safe shoe features and will help you stay on your feet. This guide is full of tips, real-life stories and sample exercises to make being healthy and active fun. It suggests everyday activities and exercises for strength, balance, flexibility and endurance that you can do at home. A separate workbook is also available (see below). 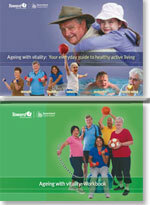 This workbook is to be used in conjunction with Ageing with vitality: Your everyday guide to healthy active living (see above) to plan and record progress as you increase your levels of physical activity and improve your fitness. To order the Ageing With Vitality go to OfficeMax. This directory provides information about services and activities in the Cairns area that encourages healthy lifestyles and helps you stay on your feet. It provides contacts for more information and links to websites where available in the Cairns area. This directory provides information about services and activities in the Townsville area that encourage healthy lifestyles and help you stay on your feet. It provides contacts for more information and links to websites where available. 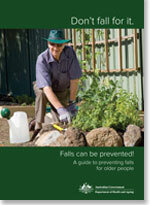 This booklet has lots of easy to follow tips on preventing falls. Produced by Queensland Health and the Department of Housing, this guide has large print and provides a range of contacts for more information. Offers a guide and checklist for staying independent by reducing your risk of injury from falling. Produced by Queensland Health’s Home and Community Care Program. Available in other languages. 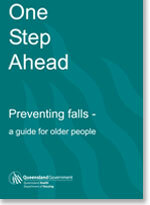 This guide to preventing falls for older people is aimed at seniors living in the community, their families and carers. It describes falls risk factors and what to do in the event of a fall. Produced by the Australian Government Department of Health and Ageing. Available in other languages.